Identification: Upperside is dark brown; underside is red-brown. Forewing above and below has tiny transparent white spots; hindwing has no markings above or below. Life history: Adults rest with their wings closed, but bask with hindwings open wide and forewings open to about 45 degrees. 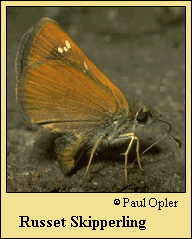 To find receptive females, males patrol above low plants in river courses, streams, and moist ravines. Caterpillars live and feed within nests of webbed leaves. Fully-grown caterpillars hibernate. Caterpillar hosts: Probably grasses such as bluegrass (Poa). Habitat: Moist valley bottoms, forest openings, meadows. Range: Southeastern Idaho, southern Wyoming, Utah, Colorado, Arizona, and New Mexico.